(Courtesy photo | National Park Service) The Bureau of Land Management has closed access to Hovenweep National Monument's Cutthroat Castle after a new property owner objected to the public using a BLM road across his land to reach this Ancestral Puebloan ruin and other sites in Canyons of the Ancients National Monument. A dispute with a new property owner has prompted federal land managers to cut off road access to archaeological sites in Hovenweep and Canyons of the Ancients national monuments just across the Utah line in Colorado. 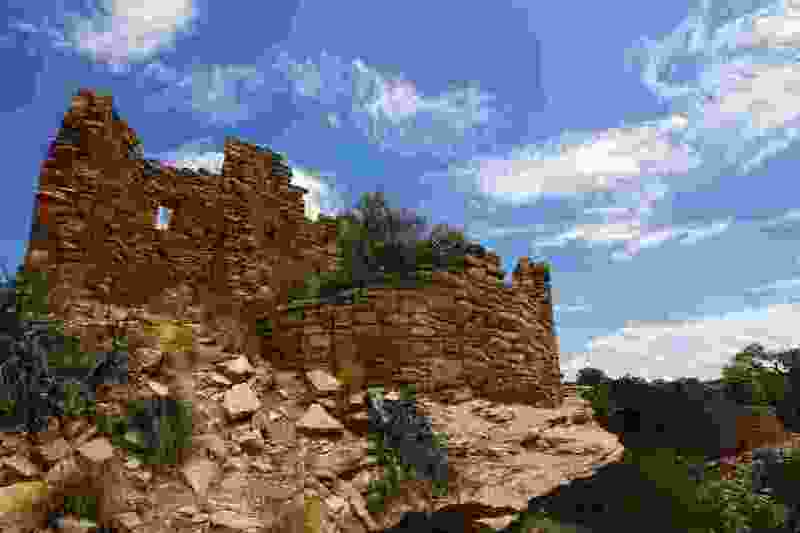 Cryptically citing “physical security issues,” the National Park Service “temporarily” closed Cutthroat Castle, one of Hovenweep’s six small units, back in August. That’s when the Bureau of Land Management closed its road crossing a 40-acre lot whose owner, according to Steve Nowlin, the sheriff of Colorado’s Montezuma County, is unhappy the public uses it to reach Anasazi ruins inside the two national monuments. To avoid antagonizing the owner, Nowlin said, the BLM closed the dirt road and plans to develop a new route. But the landowner, William Powers Schultz, said Wednesday he isn’t blocking the public from crossing his land; he just wants to protect his interests and be shielded from liability. No public easement exists across the property, and federal land managers have yet to propose anything acceptable to him, said the 64-year-old resident of nearby Cortez, Colo.
Because of the federal government shutdown, local officials with the BLM and NPS were either unavailable or unable to discuss the dispute. Tara Rigler, the BLM’s spokeswoman Washington, did not know enough about it to offer immediate comment. To fix the access problem, the agency plans to upgrade an existing route to Cutthroat from County Road 10, the paved highway leading from Utah to Pleasant View, Colo., according to Montezuma County public lands coordinator James Dietrich. Currently, this alignment is barely passable and crosses washes in two places, so upgrading and maintaining it will incur new expenses on taxpayers. While this area doesn’t see that much visitation, the dispute reflects a growing problem for the West’s public lands. To reach intriguing, historic or scenic destinations, visitors often have to cross private land. Access can get sticky if adequate agreements between landowners and federal land agencies aren’t put in writing — as appears to be the case with the road to Cutthroat Castle and Painted Hand Pueblo. President Warren Harding designated Hovenweep in 1923 to protect its famous towers, and President Harry Truman expanded the monument in 1951 and 1952 with additions in Colorado that included Cutthroat Castle, now managed by the National Park Service. The Hovenweep designations covered small parcels that held “structures of the finest prehistoric masonry found in the United States,” but left out the larger “cultural landscape” that connects these places and contains more than 6,000 recorded sites reflecting centuries of Ancestral Puebloan occupation that abruptly ended in the 1200s. In 2000, President Bill Clinton captured this larger area in his designation of Canyons of the Ancients, covering 176,000 BLM acres bordering Utah in Colorado. Among the thousands of private acres within the Clinton designation was a 500-acre tract along County Road 10 owned by Casey McClellan, who has since become a prominent political figure in Montezuma County. McClellan and his brother Kelly stirred controversy in 2009 with a proposal to develop a wastewater-processing facility on this land to serve the oil and gas industry, according to the Four Corners Free Press. That project was never developed, but the McClellans did subdivide the land into a dozen 40-acre lots known as Hovenweep Canyon Ranch. Casey McClellan did not return a phone message for this story. Last June, Schultz bought the southernmost parcel for $67,500, according to county assessor records. The lot is surrounded on three sides by Canyons of the Ancients National Monument, and Schultz is in the process of fencing it to keep out cattle and qualify for conservation status that would lower his tax burden. Using nonbarbed wire to allow big game over and under it without injury, he said, he has completed fencing along both sides of the road. But he worries that drivers could crash into the fence posts, and he would be held liable. He posted the road with three large signs that read: “Be advised: There is no known recorded easement through or across this privately owned land. You are trespassing and are responsible for your conduct. Please respect the land or I shall close the road." According to county officials, Schultz’s interactions with the public at times have become confrontational, spurring the involvement of sheriff’s deputies and BLM rangers, as recently as Jan. 19. Schultz acknowledges he has had words with people wandering his land on foot but denies ever stopping motorists or threatening anyone. He complained that his building materials and equipment have been stolen and his property vandalized. “I don’t like to be thought of as a danger to society,” he said. Monument visitors had long used this unsigned road to reach Painted Hand Pueblo, about a mile off the paved highway and just beyond the Schultz property. Another mile down the road is Cutthroat Castle, the most remote and least visited of Hovenweep’s five outlying units spanning the Utah-Colorado line. It features three round towers, a square tower and numerous kivas built on a canyon rim in the 13th century. Canyons of the Ancients’ 2010 management plan identified Painted Hand as a “special management recreation area," and its provisions appear designed to avoid the very conflict now unfolding with Schultz. They instructed monument managers to prioritize easements needed for public access to places like Painted Hand. According to Schultz, Canyons of the Ancients manager Marietta Eaton, who retired last month, proposed a 30-year easement, but Schultz interpreted that to mean the BLM would “take” the road when the term expired. She later invited him to dinner but he rebuffed the offer. Although he has no immediate plans to build a home on the land, Schultz said he is improving it with the intent of leaving it to a first responder he knows who was disabled in an ambulance wreck. She is a 35-year-old member of the Santa Clara Pueblo and could be a descendent of the ancient Native Americans who occupied the Hovenweep area centuries ago. But he said he also wants to accommodate respectful public use of the monuments' nearby sites. At this point, however, federal land managers are opting to keep the public away from Schultz’s property.